"The Valley's Best New Fairway View Homes!" 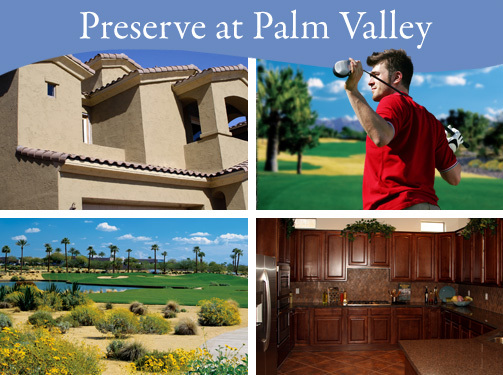 The Preserve at Palm Valley is a private, gated community with 84 semi-custom homes in Phoenix Arizona overlooking the lush green fairways of the Lakes Course of the Palm Valley Golf Club. This community of luxury homes in Arizona offers five unique floor plans ranging from 1,976 to 3,321 square feet. Over two-thirds of these stunning cottages are being built on this stunning Arizona golf property, offering premium golf course living at its best. Prices start in the low $300's. For more information about purchasing the Arizona luxury home of your dreams, please call 623-536-1806 e-mail the home builders in Phoenix AZ at Sales@ZacherHomes.com. Royal Dunes - Coming Soon! 1,976 to 3,321 sq. ft.